These great educational and institutionally designed plastic play area products are a great addition to any children's program and provide hours of fun. High quality plastic, bright colours and easy to handle pieces allow for children to experience an opportunity to join in with each other in building and interactive play. Products include Blocks, Puzzle Shapes, Snapwall Cubes, Edu-Rings, Chair Cubes (formerly Edu-Cubes), ShapeBlocs, Climbers and Activity Centres. Click on the list to view Specific Product Selection or Scroll the Page. These 3 pieces are so easy to assemble, it's a child's game. No preparation in advance for this simple and attractive toy that provides lots of fun indoors and outdoors. Measures 34" X 6" X 11 1/2". Circle Diambeter 34" outside, 22" inside. 1 Ring in 3 parts. Certified Greenguard Indoor Air Quality and Children and Schools Certification. Tested to preserve indoor air quality. Versatile 15" lightweight Chair³® for indoor and outdoor use, features radiused corners and multiple uses. 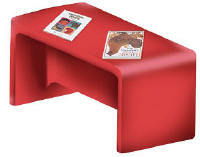 First, use as a chair with either 7" high seat or 9" high table, or the perfect seat height for adults. Manufactured from non-toxic recyclable polyethylene. Certified Greenguard Indoor Air Quality and Children and Schools Certification. Tested to preserve indoor air quality. Use our indoor/outdoor molded polyethylene Adapta-Bench® as a rectangular play table, 2 seat sofa with reversible 7" and 9" seats, or as a 15"h bench for adult seating. Bench arms are safety radiused. Available in Red, Green, Yellow or Blue - Specify when ordering. Certified Greenguard Indoor Air Quality and Children and Schools Certification. Tested to preserve indoor air quality. 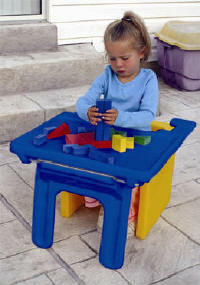 This blue plastic tray fits onto the front of the Chair Cube to provide a play or eating surface close to the child. Legs fold for convenient storage. Dimensions: 14" X 21". Certified Greenguard Indoor Air Quality and Children and Schools Certification. Tested to preserve indoor air quality. 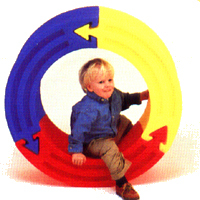 The Megablocs LP1161 set includes 16 rectangular blocks with rounded corners - four of each colour - red, green, yellow and blue. Block size: 4" X 6" X 12". Certified Greenguard Indoor Air Quality and Children and Schools Certification. Tested to preserve indoor air quality. EVA has an airtight bubble pore structure. Lighter weight, Non-absorbent and has good water and moisture-proof properties. Corrosion resistant and Non-Toxic. Strong and capable of absorbing shock without damage. Cushioning properties if a child would fall on them or be hit by a block. Easier to stack due to EVA having a non-slippery surface. This set includes 16 full blocs, 2 cylinders, and 2 roof tops. Sizes Vary. Certified Greenguard Indoor Air Quality and Children and Schools Certification. Tested to preserve indoor air quality. This set includes 48 full blocs, 6 cylinders, and 6 roof tops. Certified Greenguard Indoor Air Quality and Children and Schools Certification. Tested to preserve indoor air quality. Set of 4 sturdy molded blocks for indoor/outdoor use. Stack’em up or nest’em inside each other. 6”, 8”, 10” and 12” sizes perfect for toddlers through fives. Inverted 5/8” top lip prevents blocks from sliding off as little ones build ever higher. Total height when stacked 34”. Made from non-toxic recyclable polyethylene for indoor/outdoor use. Certified Greenguard Indoor Air Quality and Children and Schools Certification. Tested to preserve indoor air quality. Perfect indoors and outdoors, these heavy-duty blocks will encourage children to create tunnels, paths and more that explore linear and area measurement. Sized just right for children's hands and in bright colors molded into the plastic make these products a perfect gross motor skill development activity. Durable and easy to clean. 10 Year warranty. Certified Greenguard Indoor Air Quality and Children and Schools Certification. Tested to preserve indoor air quality. Available in Canada only. 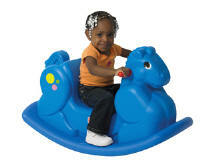 Made of Durable Molded Plastic, children can use these activity centers indoors and out for fun year round. This sturdy molded plastic unit provides two activities in one. A rocking teeter-totter on one side and flip it over for a toddler bridge. Compact size makes it handy for indoor and outdoor use. Blue safety rails help children balance when using the bridge. Dimensions: 24" X 48" X 12". Certified Greenguard Indoor Air Quality and Children and Schools Certification. Tested to preserve indoor air quality. Heavy-duty axles and wheels - Hold up to 200 pounds. 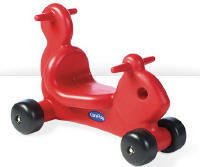 Handle on tails allow ride-on to be used as a walker. Low seat makes climbing on and dismount easy. Created specifically for a multi-child environment. Perfect for indoor and outdoor use. Bright colors are molded in and will not chip or peel. Recessed wheel hubs will not poke or scratch riders. Wide wheel base helps prevent tipping. Ages 1 to 3 years. 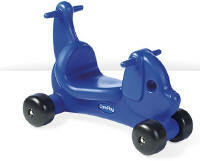 Ride-on measures 23" L x 17.5" W x 13" H. 10 year warranty. Available in Blue, Red, Green and Purple. Available in Canada only. 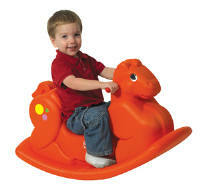 No need to ask for smiles - they arrive automatically when toddlers climb onto these sturdy molded rocking horses! Sized just right for ages 1 through 3 years old, measuring 33.5"l x 14" w x 20" h seat height 8". Riders sit and push with their feet, which gives them ultimate control of speed and stopping. One-piece molded body. Made of lightweight durable plastic, perfect for toddlers. Heavy-duty axle and wheels. Wider base to help prevent tipping. Indoor or Outdoor use. No assembly required. Ages 18mos and up. 2-year warranty. All Pricing in US and Canadian Dollars as specified - Prices Subject to Change. Consumers may purchase products. Allow 2-3 weeks for delivery. Products are Shipped Freight Prepaid.